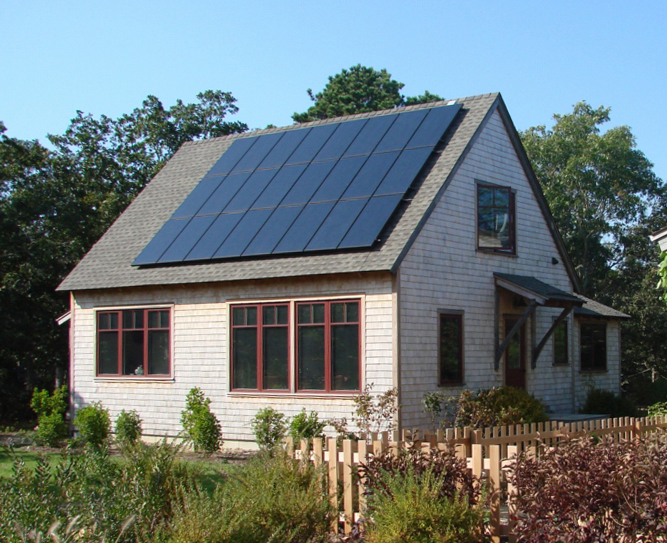 One of the eight superinsulated homes at the Eliakim's Way neighborhood on Martha's Vineyard in Massachusetts. 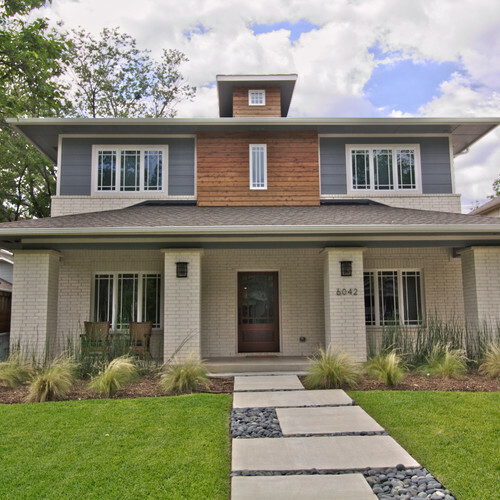 Some of these homes are occupied by families who use less energy on an annual basis than their roof-mounted photovoltaic arrays produce — making them net-zero-energy families. If you design a “pretty good house” with R-20 basement walls, R-31 above-grade walls, an R-49 ceiling, triple-glazed windows, a minisplit heat pump, and an HRV, what should you do next to reduce your energy bills? Maybe aim for the Passivhaus standard? Rosenbaum is the director of engineering at South Mountain Company on the island of Martha’s Vineyard in Massachusetts. He has helped install monitoring equipment at 12 all-electric superinsulated homes in New England, and he presented the monitoring data from these homes at the Portland conference. The homes varied in size from 1,200 to 1,600 square feet; each house had between 2 and 4 occupants. The energy-related specifications for these homes were listed in the opening paragraph of this article. The homes are quite tight — a few of them passed the Passivhaus airtightness goal of 0.6 ach50 or less — and have more insulation and better windows than most new homes. However, they fall short of meeting the Passivhaus standard. Domestic hot water is provided by electric-resistance water heaters. Each house has a 5-kW roof-mounted photovoltaic (PV) array. Rosenbaum has monitored the homes’ energy use patterns for four years, with submeters that record the electricity used for space heating and cooling, domestic hot water, ventilation, and miscellaneous electrical loads (lighting, appliances, and plug loads). Although Rosenbaum’s presentation was focused on net-zero-energy buildings, he occasionally commented on the Passivhaus standard. Thanks, Marc, for the incredibly important monitoring and engineering you're doing. And Martin, for helping distribute this and other findings. Martin's write-up could lead people to think that I'm disdainful of the Passive House movement, which is not accurate. I've critiqued certain major shortcomings - the one standard fits all climates approach, the small house penalty, not being able to count some (but not all) of the PV output against primary energy. I've suggested that all standards need to move from specifying performance per floor area to, ultimately, setting a limit in primary energy per person - creating a budget to work within, and embracing the concept of resource equity. A 1,400 sf ranch built to 2012 IECC likely uses less energy than a 5,000 sf PH, and certainly uses less embodied energy. I attended the Portland conference rather than the PHIUS conference in San Francisco as a consequence of taking my own carbon impact seriously - flying to SF is equal to my driving for one year. However, the Portland conference was the "loyalist" conference, aligned with PHI, and as Martin's article about his interview with Feist makes clear, PHI is not headed to deal with these flaws. PHIUS is taking this on, and I'm excited about the future of the PH movement in the US because of this. Thanks for your comments. I appreciate your clarification concerning your feelings about the Passive House movement, since I certainly don't want to misrepresent them. Like Dan Kolbert, I'm very grateful to you for sharing the monitoring data you have accumulated, and for your sharp analysis of energy issues. Marc would you please help clarify a few points ..
1- The houses son the Vineyard, they use LED/CFL lighting already ? 2- Would you rate the occupants of these monitored houses energy-wise in their plug use ? 3- what would be then net energy gain from moving to a HPWH ? any info on this available ? 4- Could you please elaborate on why you believe that a standard with a per capita energy allowance would be better suited ? The energy savings just from using efficient bulbs is larger than regular folks might think. In almost any US location you can yield 9016kwh/year with 8kw or less of PV. The un-subsidized current installed cost of that system in Germany in 2014 would be about $15-16K, but in the US it's about $30, but falling rapidly. Industry analysts & investment bankers all seem to believe that will drop to $10-12K in the US before 2020, with even modest policy support from regulators. A house using 9061kwh/year may need ~20kwh of battery to ride out a stretch of cloudy weather or snow-covered PV, but even 10kwh of battery would be more than enough to get by 90% of the time (more, for those willing to cut back on plug loads during cloudy weather.) If the installed cost of battery systems hits $200/kwh by 2025, as some are predicting, that clearly extends the value of the solar to the owner, and dramatically reduces the amount of power drawn from the grid, even with an 8kw PV array. At that point unplugging from the grid becomes a choice, but that hopefully won't be how it plays out. If staying hooked up to the grid stays cheap (or even profitable, selling spot-market power to the grid), most would still opt to stay connected, which has a great benefits for keeping the grid stable and keeping rates low for non-solar customers, since the marginal cost of that PV output is effectively zero. How the utilities and regulators manage this new competition matters, for all ratepayers and utility company shareholders alike. This is great food for thought. Even for an older small house that has standard "weatherization" type improvements and an efficient heat pump or gas heating, lighting/plug loads can easily be the majority of energy use. My personal estimate is about 53%. Unfortunately it is difficult to chip away at this. I've weighed the financial payback of an induction stove and it just didn't make sense. My lights are all CFLs and LEDs are only a tiny improvement over that, so I'm not upgrading until my CFL supply runs out. We have fairly minimal lighting as well, and mostly turn lights off when not in use. My fridge and dishwasher are already pretty good. The washing machine doesn't use that much energy. The dryer uses plenty but heat pump models aren't here yet and when they are, I fear the price will make them similar to induction in terms of a payback period. I've gone around the house with a Kill-a-watt and found no egregious plug/phantom loads. I feel stuck. Granted it's only about $65/mo spent on these things, but I'd like to reduce it and can't really find any good opportunities. For someone in your situation, the next step is probably to install a PV system. It's a lot easier to work out the issues when planning a new house. It would be nuts for someone to toss out existing dryer or cooktop or a better one. But I'm getting ready to buy appliances and lighting for a new house. The benefits of induction are not primarily money saving. I can avoid a propane tank, avoid the need to deal with combustion air and combustion by-products and get much better performance. I like to cook, so induction is a great choice, even though it costs more. Whirlpool is just coming out with a heat pump dryer. It'll cost more, but be cheaper to run. The biggest selling point is that I don't need a big hole in the envelope to duct it. No more hot air leaving and cold air coming in. LED lighting is now cheap enough. 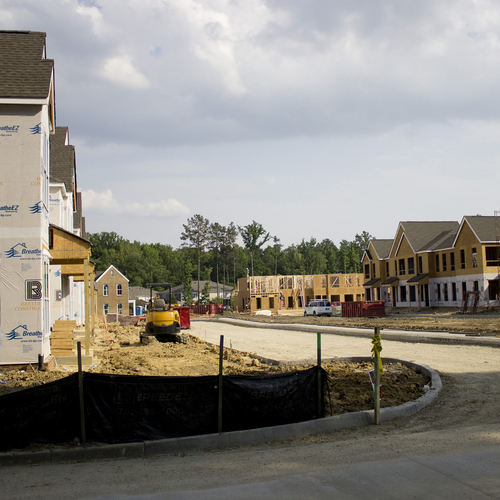 "To reduce energy use in these houses, the next step would probably be to install a heat-pump water heater." I don't agree. The original problem with solar hot water heating was the complexity required to make the system dependable over time. That problem returns in spades when using a heat-pump water heater. Plus, unless I'm mistaken, one would still have the problem of rusting out unless it's a stainless steel or fiberglass tank. Finally, one more issue: it pumps cold air out and will cool the air in any room it sits in. None of these are small issues and the cost of replacing a very expensive heat pump water heater can easily overcome the electrical savings involved. My bet is on getting a fiberglass water heater, like a Marathon, for about a thousand dollars. It should last for the owners lifetime if their literature is to be believed. Since it's electric you can use solar PV to feed it, just like any electric water heater. But you don't have to replace it every 10 years or so like conventional glass lined water heaters. If you really want to save money on water heating then get together with your family and together agree on a set time period within a 24 hour period when showers, clothes washing, and dishwashing is to be done. 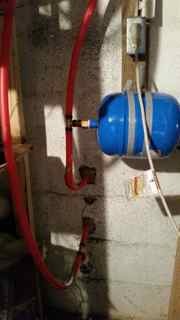 If you do this then you can operate your water heater on a timer which turns the heating element off for many hours of the day. I think perhaps one could really cut down one's electric bill by doing this. It would require a lifestyle change so many people wouldn't be happy with that, though. HPWHs are, in principle, as complex/dependable as a refrigerator. No one seems to worry much about refrigerators. The tanks on cheaper units do still rust out, but with diligent flushing and anode rod monitoring/replacement, you can make a tank last a lot longer than 10 years. In Portland OR we're lucky to have pretty soft water, so water heaters often last 20+ years. There are often incentives that make HPWHs price-competitive as well. Here you can actually get a GeoSpring for basically free, though I realize that is not the norm. The cold air can be a downside in colder climates, but the dehumidification is often welcome in a basement, so it's not all bad. In warmer climates, it makes even more sense. With a ductless heat pump, even in winter months, the HPWH is still generally running with a COP of over 1.0, even if you consider it to be "stealing" heat. If we assume that typical water heating cost with resistance is $30/mo and you cut that down to $15/mo with a HPWH, then it only takes a few years for the HPWH to pay for itself if you buy one for around $1000-1500. Also, the standby energy use of a decent water heater is quite low, around 5%. So turning the water heater off doesn't make a lot of sense, especially considering the hassle. The water heater timer only buys you a tiny amount IF you run the tank tepid, parking it a lower temp until an hour or so before you need hot water again. But that approach also reliably parks it in the Legionella Lust temperature zone for hours & hours each day, where they breed like bacteria fed on only testosterone & Viagra. It's not worth the risk. Reliability on many heat pump water heaters currently out there leave something to be desired. The SHOULD be as reliable as a refrigerator, but experience with initial offerings seems to indicate otherwise. They'll have good "payback" in high-cost electricity areas, but as PV gets super-cheap the heat pump water heaters need to get cheap (and more reliable) too. I'm cautiously optimistic. Well, I'm not too sure about your numbers when spread to a nationwide average. It is very easy, (even I do it!) to take one's own regional influences, both economic and climatic, to reach conclusions that are not widely applicable. In my area we never get more than ten years out of a conventional water heater. I'm sure the GeoSpring is made conventionally considering its price and will rust out in most areas within 10 years. I don't think the average person, including myself, is conscientious enough to replace the anode regularly. If you are such a person then kudos to you. I'm the kind of person who prefers something very dependable. The more I pay for it then the more dependable it must be. Offsetting that is the amount of money you save in electricity for the more dependable item. If it's a wash, which I think it is in the case of most water heaters using a conventional tank with a heat pump added, then I go for simplicity and peace of mind. I hate taking cold showers with a passion. I've done it enough when old water heaters break down and don't want to do again. I'd rather have very reliable long life water heater that can be fed with increasingly cheaper and more efficient solar PV panels as time moves inexorably forward. "Also, the standby energy use of a decent water heater is quite low, around 5%." Do you have some references for that? This issue isn't clear-cut. There is a strong argument to be made for an electric-resistance Marathon plus a few extra PV panels (rather than one of the current generation of heat-pump water heaters). Since I have a PV panel that is 34 years old and still performing just fine, I'm fairly confident that PV panels are long-lived and trouble-free. I suspect your residential installed PV price estimates for the U.S. are a little bit behind the times. Down here in central Virginia (with little/no state/local incentives and not a lot of competition or experience among the installers compared to other places) we're paying just over $3/Watt through bulk purchase agreements (http://solarizecville.org/) Side note - we're roughly doubling our city/county's installed residential PV capacity in just 3 months! It's a moving target, but $3.75-$4 ish per watt is probably going to be the US average for 2014 for small scale solar. I know there are hot-spots in Texas shooting in the mid $2s right now, but many places are still in the high-$4s or even $5s.. I didn't want to exaggerate on the low end, but may have overestimated on the high end. In Q2 2014 in MA I saw quotes between $3.75 and $4.25 for installations the easy-pickin's roofs, but north of $5/watt on one project. The latter was a 2 story house with awkward roof lines to work around, no big wide swaths to just tile in a big rectangle, and inaccessible with a crane truck for hoisting the hardware. (It felt like a gouge in spite of those factors- I suspect the contractor didn't want to waste the time, since it's a hot market and you could do 3 jobs in the same amount of time that one would take.) The $4.25-ish quotes were all for 20% efficiency panels, the $3.75-ish quotes were for tier-1 Chinese panels running ~15-16% conversion efficiency. I haven't been asked to review any quotes yet in Q4. GTM will publish the 2014 quarterly average costs & installations as well as the annual figures sometime in January, and it wouldn't surprise me if Q4 averaged in the mid-$3s. But for sure it will be in the $2s or lower in most of the US well before 2020. The $30$ income tax credit expires on 31December 2016 (stepping back to 10%), but the unsubsidized cost will be low enough then that it hardly matters. There may be a ramp up in installation rates in Q3-Q4 2016 for those trying to beat the sun setting on the subsidy, followed by a comparatively slow Q1-Q2 2017, but the less-subsidized cost then will be less than the subsidized cost is right now. Note, SolarCity is going to be offering 30 year 4.5% financing in a handful of states in 2015 (that's even better than the "optimistic" map scenarios.) At an actual $2/watt (either net-subsidised, or unsubsidized cost) PV solar is NPV+ for just about everyone in the US (outside of the a few cheap-power foggy-dew pockets west of the Cascades in WA) at 5% interest. If you're paying in the low $3s your net cost is in the mid-$2s after taking the tax subsidy. There's just two adults and a dog in my household, and we use 14-15 gallons of DHW daily - pretty low. I've owned a Marathon in a previous house, and in this house have a Stiebel Eltron HPWH. IIRC the Marathon used about 4 kWh/day. The Stiebel has used 1.5 kWh/day Feb-Sep. That would be a savings of 912 kWh/year. Here on MV that's worth about $200/year. The Stiebel is the most costly HPWH, and you can likely get similar performance from others at less cost. So I doubt the marginal cost over a Marathon, without any rebates, is more than $600. That's a good return if the unit lasts. (BTW, the Marathon is polybutylene, not fiberglass.) And to provide that energy with PV would take 700-800W of PV in New England, so the PV + electric water heating isn't there yet. I lived with solar thermal on my house in NH and the system at Nerdwood was going strong after 25 years, but it was custom engineered into the house design and was all passive with no antifreeze. We've installed quite few solar DHW systems here on MV and they are definitely less reliable than the HPWHs so far in our experience. Finally, one small thing - the Marathon is quite well insulated but makes all its connections at the top, which makes it susceptible to thermosyphon losses. I went to the effort of taking the pipes over and down to create a trap before they went up, and insulated the pipes well, but it still loses heat in the pipes. The Stiebel has side connections and I believe an internal pipe upwards in the tank, and seems to lose less into the piping (subjective, FWIW). On days without occupancy I see the two Stiebels we are monitoring using about 1/2 kWh in standby, so guessing standby loss at 1-1/2 - 1-3/4 kWh per day. "Do you have some references for that?" Just look at the energy factor (EF) of any random electric water heater. They're around 0.92 to 0.95. Since we know resistance heating is exactly 100% efficient, that means that the standby loss is about 5% to 8%. A 5' tall tank with a 10" radius has 30.5sqft of surface area. If it has 1.5" of polyurethane insulation which is R-9 (U-0.111) and runs at 120F while the surrounding space is 70F (so, 50F delta T), then it's (30.5 * 50 * 0.111) which is 169.44 BTU/hr, or 50 watts. 50 watts running 24/7 for a month at $0.12/kWh is $4 per month which is 13% of a $30 "typical" monthly cost, meaning an EF of 0.87. So, this math is quick and dirty but it's within the right ballpark. It seems there is a substantial risk of getting the bacteria in water heaters with water below about 131F. Anything above that temp will kill them at progressively faster rates as the temp rises. Even at 140 degrees F it takes half an hour to kill the buggers. So perhaps its not a good idea to turn off your water heater. Then again, it might be an interesting experiment to set the heat to about 145 degrees and turn off power completely for at least 12 to 16 hours. Then turn it on and find out how long it takes to reacquire 145 degree temperatures (including 140 degrees at the bottom of the tank). Presumably there will be a seasonal difference in how long that takes. Then turn it on so it will comfortably be above 140 degrees at the bottom of the tank for more than an hour. This type of research is invaluable. I am deeply indebted to Marc for publishing it here. I guess we will now see whether Passive House is science or ideologically based. This thread is one of the most useful I've seen in a long time. A number of the technologies seem to be comparable in cost and performance so the nuances matter more - thanks to all who are contributing. I agree with your reaction to abbreviations. It's hard enough to keep up with the ones in the construction industry without throwing in slang used by texting youth. Is IIRC a building code, or something else? Anyway, as far as I can determine, this is what GBA readers need to know. BTW = by the way; BMW = a car brand from Germany. IIRC = if I recall correctly; IRC = International Residential Code. Steibel Eltron versus Marathon: let's do the math again. Assume 44 gallons/day hot water use (average North American family). Assume it takes 0.0855 kWh to raise the temperature of a gallon of 50°F water to 120°F. Using an electric-resistance heater, you need 1,373 kWh/year to make 44 gallons of hot water per day. Assuming a COP of 2.0, the heat-pump water heater needs only 687 kWh/year to make 44 gallons of hot water per day. Stiebel Eltron heat pump water heater purchase price: $2,400. Enough PV to meet the needs of the Steibel Eltron in New England: 0.555 kW costing $2,220. Marthon electric-reistance water heater purchase price: $1,100. Enough PV to meet the needs of the Marathon in New England: 1.11 kW costing $4,440. Purchase price of Marathon plus PV = $5,540. Incremental cost to go the Marathon route instead of the Stiebel Eltron route = $920. If the Marathon water heater lasts a few years longer than the Stiebel Eltron, the Marathon starts to look like it's worth considering. Moreover, the Marathon water heater is likely to have fewer service calls, and it won't be stealing any space heat from your home during the winter. Martin if you can heat a gallon of water for 0.0855 kWh it must be a metric gallon! We learned from our monitoring of a Stiebel Eltron vs a couple of Marathons (50 gallon units, so smaller capacity and therefore perhaps less standby loss, though see my earlier post about this), all three in households using a bit over 40 gallons per day. All in basements of superinsulated houses on Martha's Vineyard. The Stiebel used 1/3 the electricity per gallon - about 0.07 kWh/gallons vs. 0.21. If anything, the Stiebel has a higher setpoint. So at 44 gpd, the Stiebel saves 2248 kWh/year. If the incremental cost over a Marathon is $1,300 this is likely to be a good return - on MV it's three years. Also, keep in mind the standby loss - probably in the range of 550-600 kWh/year off of these well -insulated electric units. For the small amount of DHW we use in my household, two or three instantaneous electric water heaters might have only used 1 kWh more daily than the Stiebel is. Note that these are huge loads when operating - you need a 15 kW unit for a shower, three of these are 200A, and we have two showers and a kitchen in our 1,300 ft2 house (plus an outdoor shower, common on MV). I think, but don't know, that the Stiebel tank is very durable - it's what was Stiebel's core business in Germany. It also has a magnesium anode rod. However, it's a major job to check that rod. I intend to do it, because I'm curious, but I know most won't. Energy Factor tests use 64 gpd IIRC, so the standby losses are a smaller % of the total. I think I calculated that the Marathons we were monitoring had an EF in the mid-80s, not low 90s. I imagine, but don't know, that the DOE tests carefully exclude the piping losses that occur in real life, so over-estimate EF. BTW, AFAIK, if you had a water heater on a farm, IIRC it would be an EIEIO. I agree that data are better than calculations. Using an electric-resistance heater, you need 3,373 kWh/year to make 44 gallons of hot water per day. Using a heat-pump water heater, you need 1,124 kWh/year to make 44 gallons of hot water per day. Enough PV to meet the needs of the Steibel Eltron in New England: 0.9 kW costing $3,600. Marthon electric-resistance water heater purchase price: $1,100. 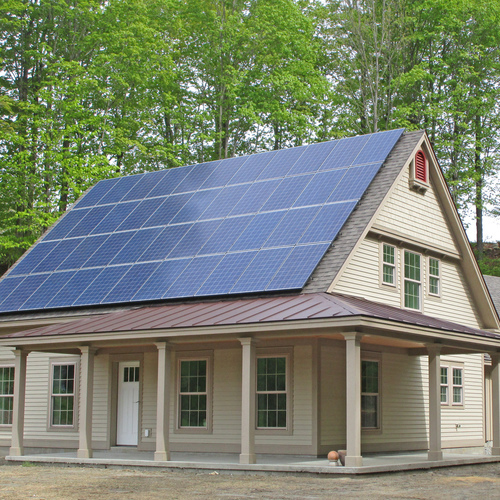 Enough PV to meet the needs of the Marathon in New England: 2.7 kW costing $10,800. Purchase price of Marathon plus PV = $11,900. Incremental cost to go the Marathon route instead of the Stiebel Eltron route = $5,900. So the Marathon heater would have to last three times as long as the Stiebel Eltron for the Marathon route to make sense (although the Marathon heater does have the added advantage of not stealing space heat in the winter). So, you've convinced me, Marc. Thanks. I have a section in the annual energy model that the students get in my zero energy homes online course that calculates the added energy that the heating system needs to provide to serve the HPWH in the winter, so I do keep track of this type of thing. In my own house, we use so little DHW that the same darn kWh go back and forth - the HPWH uses 1.5 kWh/day, and the standby losses are similar. It's a wonder those kWh don't get dizzy! Another way to look at it - the energy off off our chest freezer and PV inverter are very slightly over the energy the HPWH takes from the basement. I like the math and the field results. Are the HPWH's or a Marathon resistance heater the only cost effective ways at chipping away at the energy requirements for simply heating water? How much noise is produced by a HPWH? Would you liken it to a refrigerator? Steve- I did a little research. It looks like HPWH are fairly noisy, around 55 decibels. You wouldn't want one next to where you sleep. Most people put them in a basement. My new house is on a slab and we're wrestling with this issue. The water heater will be in a mechanical/utility room at the other end of our house from the bedroom, but we are still concerned about the noise. I hope to track down a local installation to listen for myself. As far as I can tell, the Marathon and Steibel Eltron are the high end of the two options. You can buy a GE heat pump WH for about $1100 and a cheaper resistance heater for less than half that. Opinions about longevity are all over the place. Your analysis seems to be right in your part of the country but it certainly isn't in all parts. In large parts of California, Arizona, and New Mexico, not to mention Hawaii, the solar panels required would be much less. The difference in price using your pricing structure comes to about $3000 or a little more. So the difference would amount to 1 replacement of the Steibel including installation costs and general aggravation. Of course, if you're 75 or older using actuarial tables, or plan on moving within the lifespan of your Steibel then even if you live in a warmer climate then you should go for the Steibel. Hear that, Dr. Feist? Location matters. For the question of whether there are any other good options for water heating, there are desuperheaters on heat pump heating systems. Common on ground-source heat pumps but less common on air-source heat pumps. They make a lot of sense to me and I'm not sure why they aren't more common--maybe freezing problems if the compressor is located outdoors. There are also drainwater heat exchangers, which don't remove the need for a heater, but they help. In the discussion of tank vs. tankless, I am optimistic that the smart grid will eventually turn out to be more than a buzzword, and will involve some control of water heaters (those with tanks) among other things, to help accommodate more renewables on the grid. With a tankless electric water heater, you give up on the possibility of participating in that system. You write, "Your analysis seems to be right in your part of the country but it certainly isn't in all parts. In large parts of California, Arizona, and New Mexico, not to mention Hawaii, the solar panels required would be much less." Enough PV to meet the needs of the Steibel Eltron in Arizona: 0.7 kW costing $2,100. Purchase price of Stiebel Eltron plus PV = $4,500. Enough PV to meet the needs of the Marathon in Arizona: 2.1 kW costing $6,300. Purchase price of Marathon plus PV = $7,400. Incremental cost to go the Marathon route instead of the Stiebel Eltron route = $2,900. So, if the Marathon water heater lasts twice as long as the Stiebel Eltron, the choice of the Marathon makes sense. Desuperheaters lower the cost of water heating during the air-conditioning season. As you wrote, they are most common on ground-source heat pumps. The problem with ground-source heat pumps is that they cost so much to install that they really aren't cost-effective for residential projects. I am familiar with the product, and its super-insulated plastic tank. Aside from everyone **thinking** the Marathons will last 'forever', does anyone have any real world data that says it does? What does the warranty look like? Whether plastic last for years at high temps depends on slow reactions in the plastic due to residual catalysts, etc. Have they done accelerated aging tests, for example? Here is a link to the Marathon warranty information page, which states: "YOUR MARATHON TANK IS WARRANTED NOT TO LEAK FOR AS LONG AS YOU OWN YOUR HOME." Using the EF rating for locations such as warmer parts of CA, AZ, NM, HI, would be grossly overestimating the energy use of heat pump water heat, whether the thing was installed in an un-airconditioned garage OR inside of an air conditioned house. The incoming water temps in those warmer-climate locations averages 5-20F warmer than EF test conditions to begin with, so instead of needing to raise the temp ~77F (from 58F to 135F) it's only raising it 57-72F, which is more than a 5% difference at worst, and could but could be as much as a 25% reduction right off the bat. If the unit is in an unconditioned garage the ambient temperature averages will be 5-25F warmer than EF test conditions. That reduces the standby loss for either a Marathon or a HPWH, but it also dramatically increases the efficiency of the HPWH to be pumping against a lower delta-T. If indoors it'll be 5-15F warmer than the test spec, but an HPWH will also be reducing the air conditioning load of the house as well. The amount of "additional" PV for the hot water heater in a cooling dominated climate is very modest indeed- it may be close to zero, in some instances due to the beneficial reduction in air conditioning power use. A Marathon would still see an as-used EF improvement due to the warmer, but the standby would impart a modest sensible cooling load increasing the air conditioning use. But the amount of PV required to run it is substantially less than implied by simple-math on the EF number. I used two different methods in my calculations. Neither method was based on the EF rating for either water heater. My first calculations (in Comment #22) were based on the number of BTU required to raise the temperature of a gallon of water 70 F°. The calculation ignored standby and distribution losses. 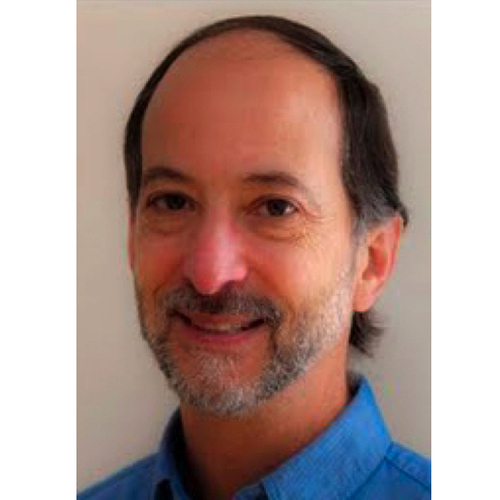 Marc Rosenbaum then (mildly) castigated me, and provided data from his monitoring studies that could be used to provide a more realistic calculation. After tipping my hat to Marc, I made new calculations (in Comments #27 and #33). These calculations were based on Marc's monitoring data (data that show how many kWh are used in actual homes to make a gallon of hot water). Although none of my calculations used EF ratings as the basis for any of my assumptions or calculations, most of your points are still relevant. You are correct that using monitoring data from New England will result in an overestimate of the energy needed to make domestic hot water in Arizona. Dana's comments invite a note of clarification relating to both the particular interchanges here about making DHW and to the overall points I made in the presentation that Martin has chosen to blog about. I'm a regionalist, specializing in heating climates, and, even then, ones with summer moisture, as opposed to cold desert climates. So my data and recommendations may be applicable to rather different climates, but I don't have that experience, and I tend to rely on experience first rather than analysis as I approach a question in the built environment. I think it's a full lifetime's worth of working and paying close attention to become knowledgeable in how to make good buildings in just one bioregion! My subjective description of my GeoSpring is that it sounds like a somewhat loud refrigerator. Not LOUD, but louder than a normal residential fridge. It's in the basement right under our kitchen and we never hear it up there, even though there is a duct and a staircase connecting the two rooms. Martin, yes, desuperheaters are most advantageous when the refrigeration/heat-pump cycle is used for cooling. (In that case, the heat is all waste heat anyway, and bleeding off some of the heat before the condenser can even boost the COP of the cooling by lowering the condenser temperature.) However, desuperheaters can also be used on a heat pump running as a heater, and it can make sense to do so. The heat that you get from the desuperheater does subtract from the heat delivered to the output, but you can get that heat at roughly the same COP as the heating system is running, even delivering higher temperature water. That COP is most likely a higher COP than you'd get running a heat pump water heater from the same source as the main heat pump (air or ground), because the required "lift" is less, and it avoids the problem of needing to pump the same heat twice that you get running the heat pump water heater from the air in the conditioned space. So it seems to me to that it would be a viable approach with air-source heat pumps across many different climates. But the next issue you raise is installation costs. I have a ground-source heat pump, and the installation cost of the de-superheater was minimal, but that is because everything is in the same room and the heat pump unit was designed with that in mind. I guess that the high installation cost in other systems is a side effect of the compressor being located outdoors. But even then, it seems like a smart design with the compressor just on the other side of a wall from the water tank should make it reasonably easy, if the heat pump was designed for it. I am associated with a company that is selling refurbished Nyletherm HPWH online. We refurbish them, install new controls and sell them for $365 delivered in the CONUS. I have used stand alone units, which seem to make some sense over the all in one units for about ten years. I believe Marc had some data on the Geyser, which was the successor to the Nyletherm. As refurbs, the numbers make HPWHs a lot easier to deal with. We are also testing a larger air to water unit for radiant heat this winter in our shop. It is rated at 42k btus. We shall see how the low end performance is. It is about half the cost of an Altherma. It seems to make sense that an air source heat pump with some thermal buffering makes sense. Since I anticipate the HP will stop working efficiently at some point, we are working on a batch fed pellet boiler that would be an inexpensive back up system for those 14 or so days we expect poor HP performance. The pellet device is gravity fed, low mass and requires a buffer tank. Then again, it seems that a lot of pellet boiler manufacturers are using some buffering to minimize short cycling of more conventional pellet boilers. Will report back when it gets cold. Sorry, I seem to have digressed slightly from the thread. 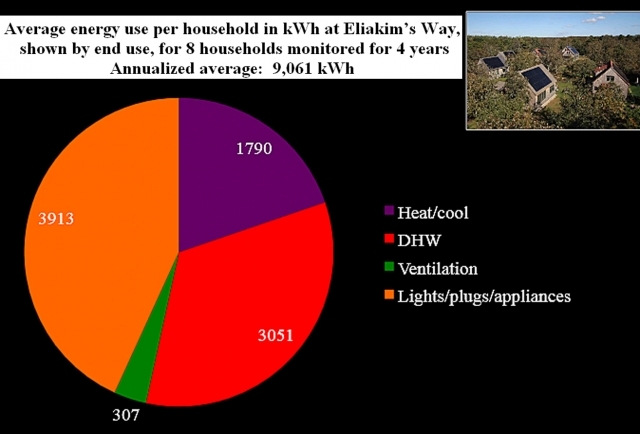 We live in a mini home that is 16 x 68 and we used a grand total of 10,071 Kw hrs over the last year. We have a Mitsu 12,000 btu mini split heat pump that does most of the heating and all of the cooling.. Baseboard backs up the heat pump. The next project is to try to reduce the DHW costs. My plan is to install a new resistance tank with a preheater tank installed in an insulated enclosure. The new tank has a rated heat loss of 57 watts an hour. The preheater tank will recover that lost heat for a saving of 499 Kw hrs a year. I will use some charcoal to control the moisture in the enclosure. Should be quite reliable. With 57 watts of standby x 24 hours/day x 365 days/year you're looking at about 500 kilowatt-hours of standby loss annually. That's 5% of your reported total power use! At New England style insolation levels you would need about 350- 400 watts of PV to support that standby loss, or about two typical-sized panels. At $3/watt installed cost that's over a grand in additional PV just to support the standby loss. Mind you, half the time (or more) the standby is reducing the load on your mini-split, and 1/4 of the time it's adding to the cooling load, so it's a net reduction in heat pump power. But the amount of mini-split power saved is on the order of 100kwh or less, due to the 3-4x higher efficiency of the mini-split compared to the resistive element in your water heater. You're still talking at least 300 watts of additional PV to support that background load. With a heat pump water heater you'd be looking at less than 1 full additional PV panel, since over half the heat going into the water is effectively sourced by the mini-split at something like 3:1 on average. Nick Welch mentions above that his clothes dryer uses a substantial amount of energy. I saw a US EPA report from I think early in the 2000's that suggested that clothes drying is a material fraction of US residential electricity use. As per the attached image a massively distributed, resilient, fault-tolerant, low-maintenance solar capture device is available for this application. The unit pictured is at the high-tech end of the technology spectrum for these devices with other models available as a line attached between two mounts. And we also have a solar-woody biomass hybrid solution for wet weather AKA the clothes-horse in front of the wood-heater. 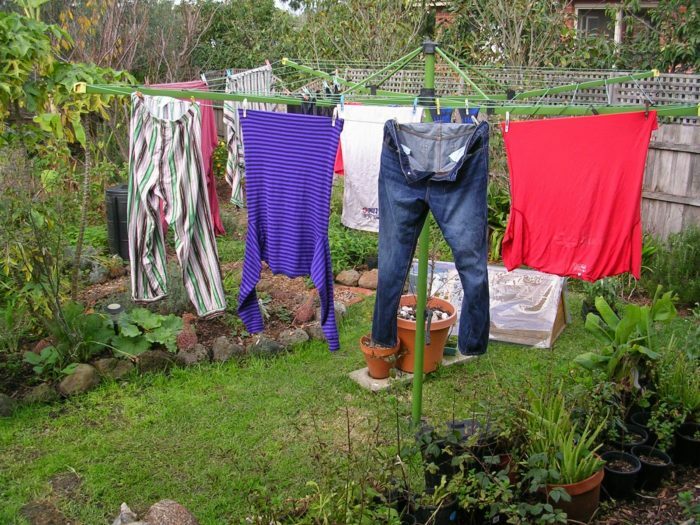 I understand that outside clothes-lines are banned in some US housing estates. And a dryer may be needed for areas with continuous poor insolation during winter or in tight houses where hanging out laundry to dry in winter will lead to unacceptable internal moisture level increase. PS Anyone who read the thread about PH in warmer climates on GBA several years ago may be interested to know that there's a glimpse of the infamous fruiting banana at the top left of the photo. And a miniature cultivar in a pot at the bottom right. Is that the low-hanging fruit? Malcolm, you're not paying attention. There is no low-hanging fruit. Sadly Martin was correct. We had bunches developed on several plants, profuse quantities of small green bananas appeared but they didn't survive winter. Winter here is woosy compared to higher latitudes in the northern hemisphere but even though ours are cool climate banana cultivars the fruit didn't cope with a few frosts. There's an "on-the-edge" plant growing community in Melbourne as there is in many parts of the world and some people do get bananas to fruit successfully. But it does tend to involve heat-trap micro-climates or greenhouses. Glorious looking plants, however, and very hardy in our experience. Ours have grown through frosts and the last half of the Millennium Drought with minimal attention. The babaco on the left of the picture is a cold tolerant equatorial plant that fruits prolifically at our latitude. (~38S) The pepino smack bang in the middle of the picture also fruits very well this far south. And it fruits in our winter. I installed a marathon about 5 years ago and have been pretty happy with it, but not so happy with my rough average of 160KWH per month to heat my water. Nor am I thrilled with the very measurable impact of the dehumidifier I have to run in my basement to keep it below 60%RH down there. Ive only recently been considering tricking out the roof of my 20's era small home with PV as I think it could get pretty close to Net-zero by upgrading to a mini-split (currently oil furnace). Water heating is currently the biggest load in my home but the dehumidifier is a nasty detail, probably close to the fridge in energy use. A heat pump water heater seems the perfect fit for my situation, killing one bird and possibly turning the other one from a starling to a chickadee (sorry, they are squawking away as I write this). Another possibility for the gardeners and tinkerers, a compost water (pre) heater. Results are very early for my newly installed ~450$ version but Iam pleased so far. The first month of usage has cut my water heater KWH in half although Ive already noticed a decrease in output. It was sending 100 degree water to the marathon but has already dropped to 90. 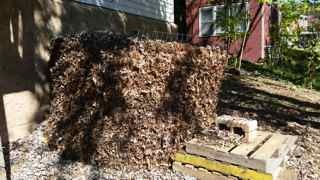 Iam hoping it will stay above 70 through the winter till I change out the material and harvest the byproduct/primary goal of the compost water heater: Compost! I will try to return some day soon with a blog link of more detail. Your comment reminded me of something that occurred to me after installing a HPWH in my own home. An important, but not always intuitive, way of thinking about these during the heating season is that if you don't use any hot water it is actually adding heat to the home from the work of pumping the same heat back into the tank every so often. Space heating only has to make up what goes down the drain. Which brings up drain water heat recovery, a whole other blog post by itself I'm sure, but some something I'd like to see some real data on. Let me introduce you to the Climate master Trilogy geothermal system with 24/7/365 hot water generation. With a EER of 45 and a COP over 5 it is the most efficient heating cooling hot water generation product on the market. In spring and fall it disengages the ground loop and uses the hot water tank essentially becoming a geothermal hot water heater and free cooling/dehumidification is a byproduct. Mini split heat pumps are a miserable product to maintain and service and in most cases will likely only last 10 years. Geothermal has a life expectancy greater than 25 years so I disagree with the author's comments that geothermal systems are not cost-effective. If you look at lifecycle cost averaging there is nothing more cost-effective than a geothermal system and with climate Masters ability to heat water 365 days a year at roughly 1200 Watts this system should be a staple of net zero construction. I am currently renovating a 1959 constructed house with the goal of net zero, I'll report back in about a month, but I'm pretty sure with the geothermal, my spray foam and 5.5 KW PV that I should be zero or better. Any experience with Waste Water heat recovery? This seems like a no brainier... at 60% efficiency I bet it would reduce total hot water usage by at least a third. The GBA site has lots of articles on drain water heat recovery devices. There is an article in the GBA Encyclopedia on the topic: Drain-Water Heat Recovery. Alex Wilson wrote an article on the topic: Drainline Heat Exchangers. In one of my articles, I recommended their use: Ten Ways to Improve a New Home. We've written news articles about them: Drain Water Heat Recovery Gets a Boost in Ontario.